This chapter examines the ontogenetic perspective of desistance theory, concluding that it offers an incomplete and gender-blind approach to explaining contemporary female desistance journeys. 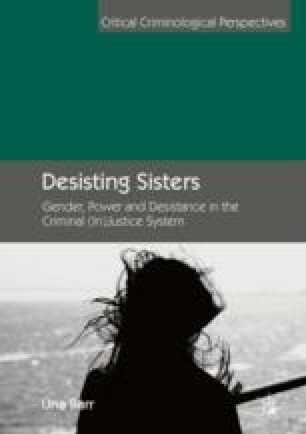 This chapter analyses three trajectories of transgressing the law experienced by the women involved in the research; early-onset, late-onset and one-off transgressions of the law. These trajectories contest the findings of authors such as Gottfredson and Hirschi (A General Theory of Crime. Stanford: Stanford University Press, 1990) that desistance is something which happens naturally with the passage of time. Instead, this chapter will argue for a critical analysis of desistance, rooted in feminist theory and epistemology.